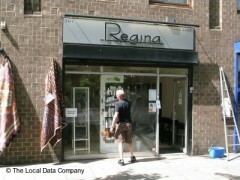 About: Regina Hair & Beauty is a unisex hairdressers that offers a cut and dry service. Very pleased with my new hair cut! Andrew did an amazing job with some new highlights and trim. Would recommend this to a friend very friendly staff. Best salon I've been to in a very long time! Lovely people, genuinely friendly, professional and competent. My haircut was great, I only needed a simple trim, but somehow in other salons when I ask for that I always come out with some weird cut that doesn't suit my hair. Not so here. The hairdresser was very competent and managed to cut and shape my hair in a style that goes with my hair type and which I can reshape as I want and I am confident will grow out perfectly. This is the best hairdressers EVER!!! Thank you Andrew, Jane and Kim for always smiling, doing a great job and making my hair look great. This Salon is friendly, reasonably priced and does great colour, cutting and treatments. Full marks! This is a fantastic hair salon in Kentish town, I would never let anyone else touch my hair again, Andrew and Jane are both fantastic and I was absouloutly delighted with my hair. They are so friendly and make a wonderful cup of tea. Fully recommend this salon, you won't be disappointed!